During my injury downtime I read two excellent books. 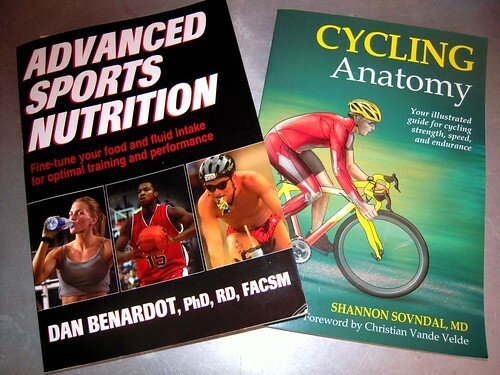 Advanced Sports Nutrition by Dan Benardot covers all of the basics of feeding yourself. The book doesn't contain any secret formula for instant success. It's not a diet book. It's just a solid science-based outline of what to eat, and most importantly why. This book explains the role of each macro nutrient, vitamin, and supplements in sometimes painstaking detail. Beware, it's almost textbook like at times. But that's what makes the book so good. It's not a junk science guide to eating. Cycling Anatomy by Shannon Savndol is per subtitle "Your illustrated guide for cycling strength, speed, and endurance." This book effectively illustrates each muscle group, explains that muscles' relevant role in cycling, and prescribes exercises for strengthening each group. The book covers the rider from head-to-toe including the all important core muscles. Cycling is more whole-body than I'd realized. Reading this book has been one of the motivators for increasing my crosstraining effort this year. Both books are execllent reads for any cyclist looking for basic knowledge of how their body works. Neither provide dramatic revelations, but provide good background and reinforcement of knowledge most cyclers have cobbled together from many sources of experience.